Kerasia has a distance from Karditsa of about 32 km, and 3 km from the lake. 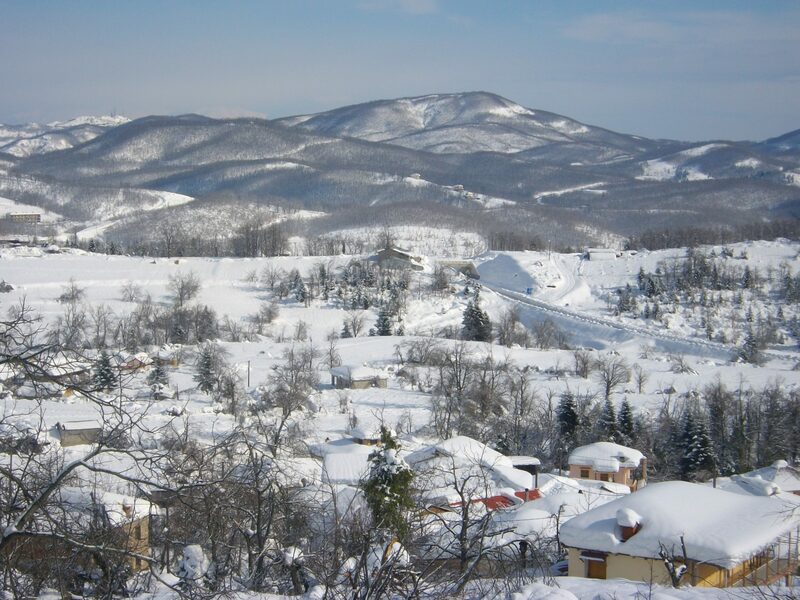 It is built on an altitude of 950 m. beneath the mountaintop “Monoplati” at the road of Mouzaki – Plastiras lake. The village has a very good climate and many cherry trees, from where it has got its name. The oldest mention of the village is at a golden bull of Stephen Dushan in 1343. Today 129 residents live at the village but according to the census the inhabitants’ number is 390. There are many springs, traditional cafes in the village square with polite and friendly professionals and rooms to rent. The view to Mouzaki, to Meteora and to the thessalian plain is unique. The village is surrounded by a beautiful pine forest. According to the tradition, Karaiskakis had here his tambouria (fortifications). A monument was erected with the participation of local residents in memory of the battle with the Turks at Koutsokera. The area was also a cozy retreat for National Resistance fighters. The view from the peaks Tsoumaraki and Palaiomonastiro at 900 m altitude is amazing. The cave of Kalogerogiannis which has stalactites and stalagmites is remarkable. The Kerasiotis river stems from “Itia” and “Monoplati” and passes on the edge of the village. Along its route it crosses the dense forest and shady plane trees. Formerly the waters of the river were putting in motion watermills and water vine harvest installtions, which gave vividness to the village. The carpets – rugs of the households are washed still nowadays in mantania that located in the homonymous place which is far away 3.5 km from the paved road. In the huge forest area of the village there is a wide net of forest roads for walking and recreation. A path from the top of the village leads us to the addle of St. Nicholas in the Eastern Argithea towards the northwest (forest road at the biggest part of route). 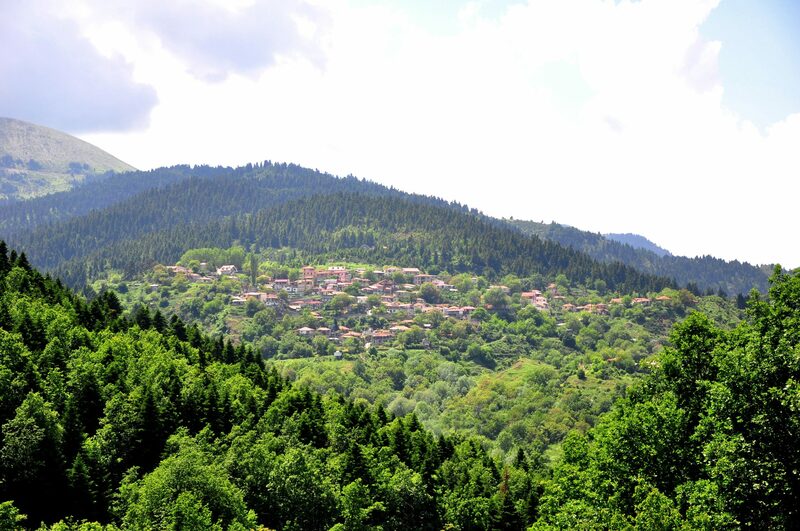 From Kerasia, the road continues to Mouzaki, to the beautiful villages of Argithea, to Achelous, to Arta , to Pertouli, to Trikala and to Kalambaka. The old churches of the village which are remarkable for the visitor are the church of Assumption (with frescoes of 1637), and the church of the Life Giving Spring (1875) in the center of the village. The stone steeple of the church is a jewel for the entire region. “Koulouma”: At the Clean Monday. A cultural week in the mid-August with concerts by distinguished artists. Traditional Feast. It takes place on the 21st-23th of August. It is the culmination of the last events of the festivals of the region. Three Cultural Associations (Athens, Volos, Karditsa) operate at Kerasia. The clubs have to experience a rich cultural work with many traditional events and elaborate versions. The local newspaper is published under the responsibility of these clubs.